From Kodachrome State Park, UT we took scenic highway 12 to Torrey then took scenic highway 24 to Hanksville and then finally scenic highway 95 to Blanding. 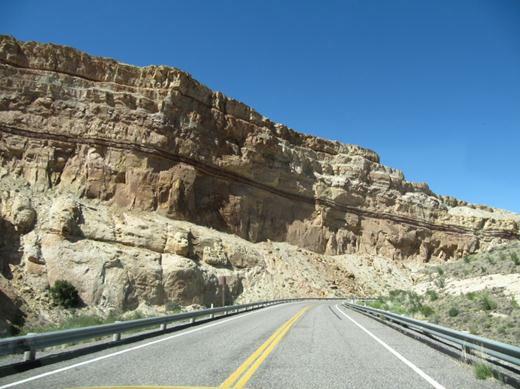 You would think from the high number of “scenic highways” they have listed that they are exaggerating but in all honesty….OMG!!!! 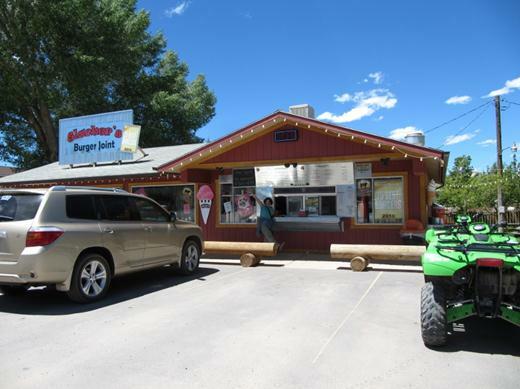 We stopped by Slacker’s Burger Joint in Torrey, UT for a tasty burger. In 2010 Slacker’s ranked #5 out of 75 top burger joints in the state…very good and the view of the snow covered mountains was to die for. Then we hit the road again for more beautiful views. 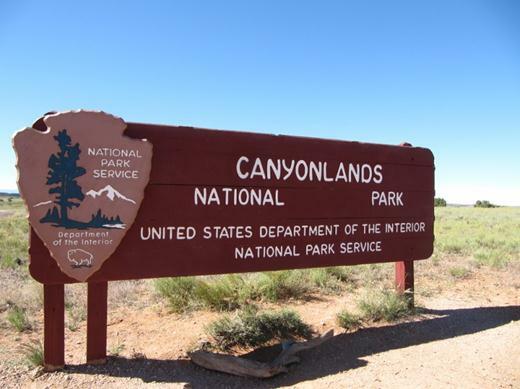 Since Canyonlands National Park and Arches National Park have entrances near each other we decided to look for a campground in or near Moab, UT. We settled in at Horsethief Campground for $12 a night although we really wanted to camp at Dead Horse State Park – just down the road. An electrical site opened up on our second day in the area so we moved over and set up our campsite there. For $20 per night we had electricity and toilets with running water! 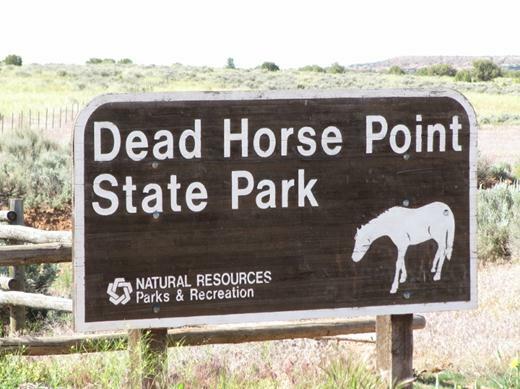 If you’re wondering about the name – well, it’s because the legend describes cowboys herding wild horses to the Point where sheer cliffs and a narrow entrance point made a perfect circular holding pen. The name came when some forgetful cowboys left the point while horses remained in the pen!!! Needless to say the next bunch of cowboys to come across the point had a horrible surprise. The views from Dead Horse State Park are amazing. Those blue pools in the distance (and outside the park) are a potash mining operation. Cobalt blue dye is added to the water to help speed up the evaporation process and in the end they are left with potash. 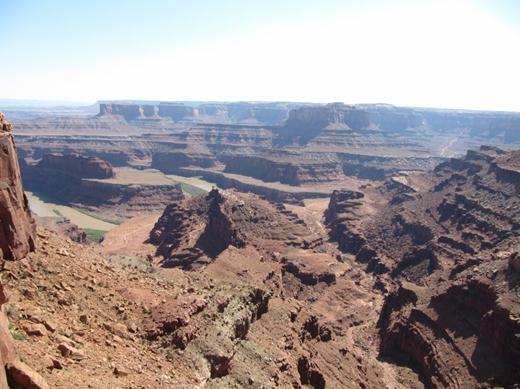 And here’s a view of the Colorado River from Dead Horse Point. 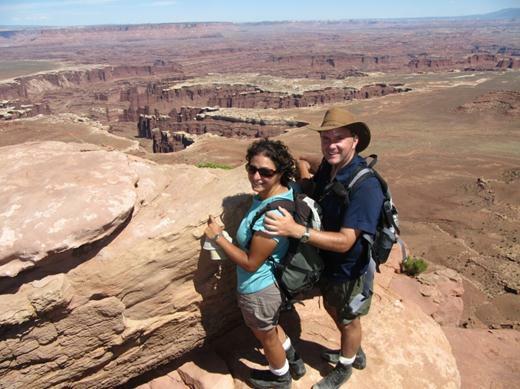 From Dead Horse Point State Park we made our way to Canyonlands National Park. 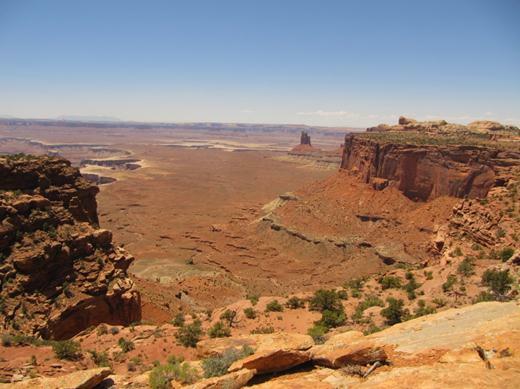 Canyonlands has three main areas: Island in the Sky, the Needles and the Maze. 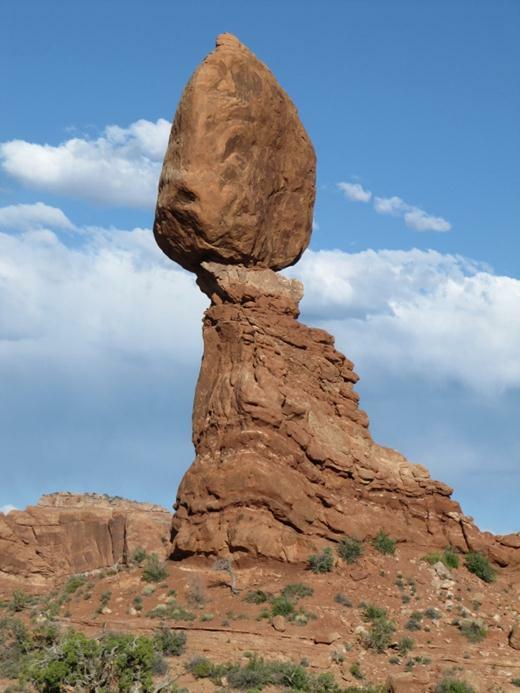 Only Island in the Sky and Needles are accessible by paved road. We opted to visit Island in the Sky. What a view! 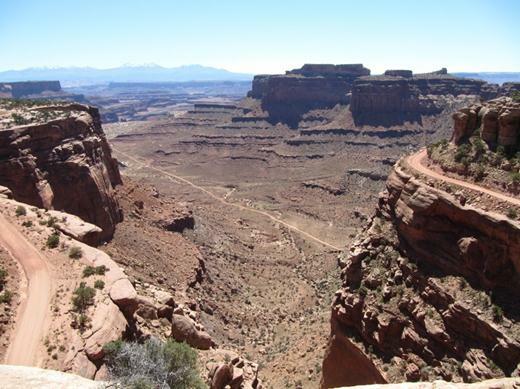 Notice the backcountry road (right side of the picture) coming around that 2000 foot drop!! 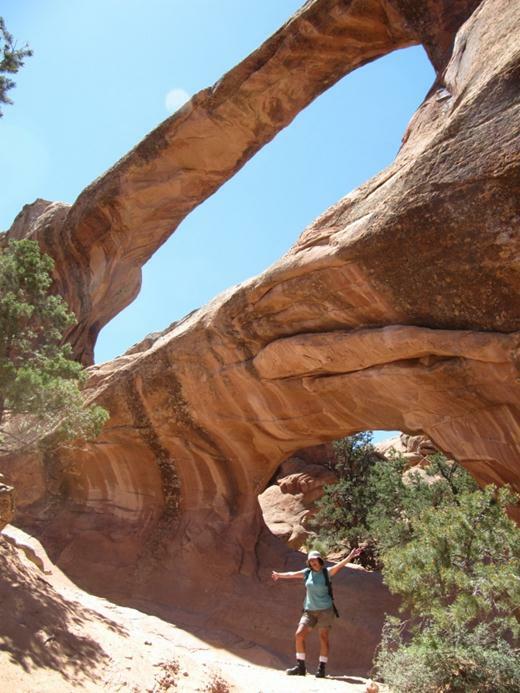 It was a bit of a surprise to see an arch at Canyonlands! Behind Jason is another 2000 foot drop! 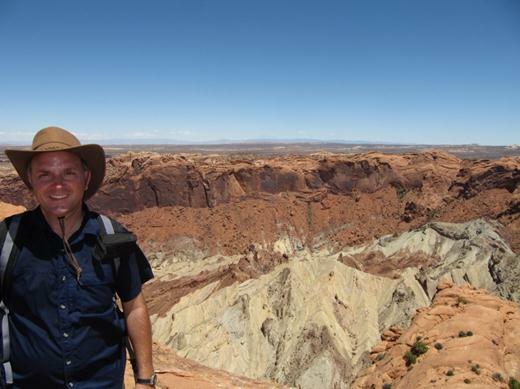 Check out this Upheaval Dome. 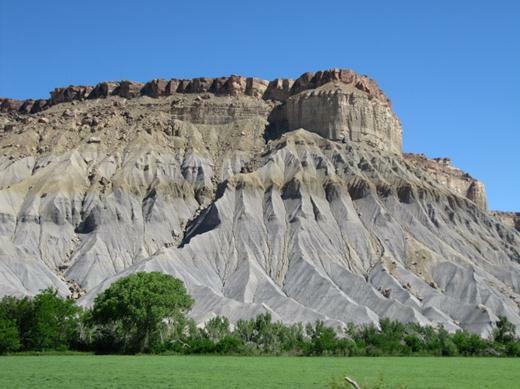 Scientists are still debating whether it’s the result of a meteor impact or a salt dome uplift. 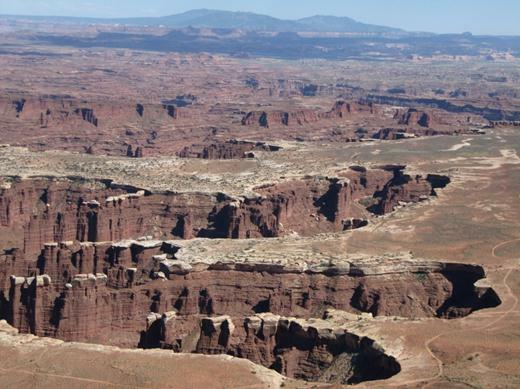 From these cliff tops to the white rim of the next level of cliffs is a 1,200 foot drop. 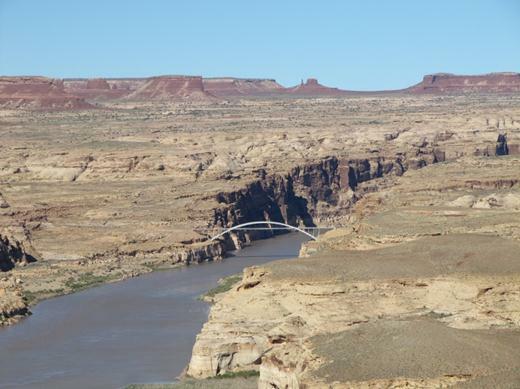 From the white cliff top to the Colorado River below is another 1,000 foot drop. So that puts us up at about 2,200 feet…mind boggling!!! 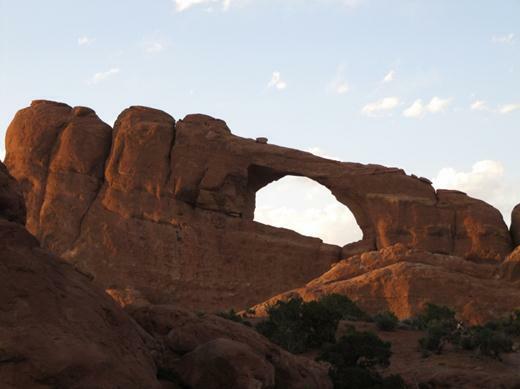 We spent two days touring Arches National Park. 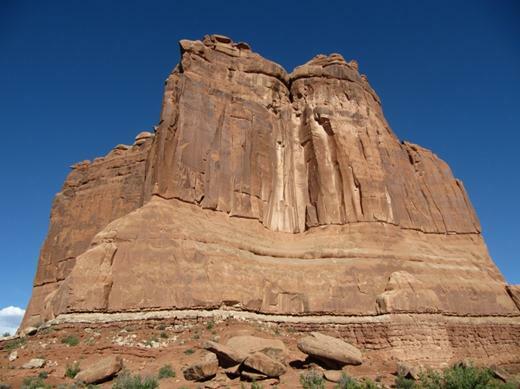 One of the first viewpoints – Courthouse Towers – was remarkably similar to Monument Valley! 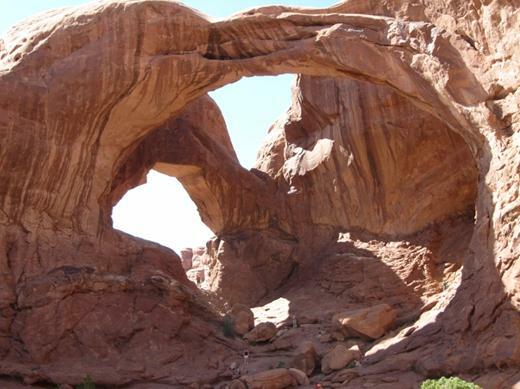 There’s one – the Delicate Arche – one of the most photographed arches around. 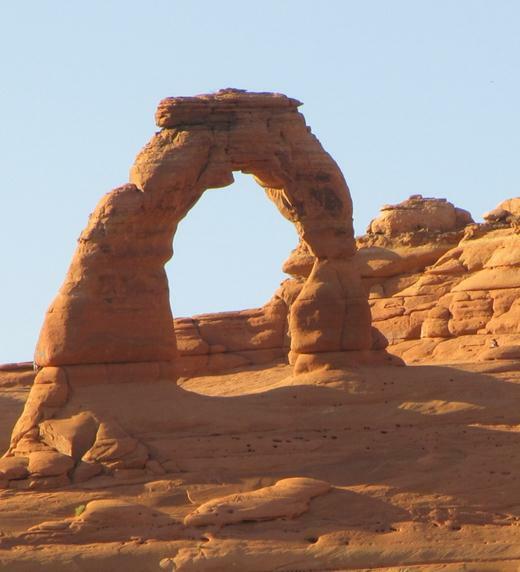 This one is called Skyline Arch. 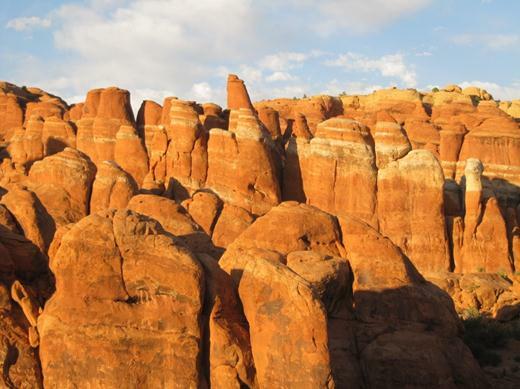 This picture shows the Fiery Furnace. 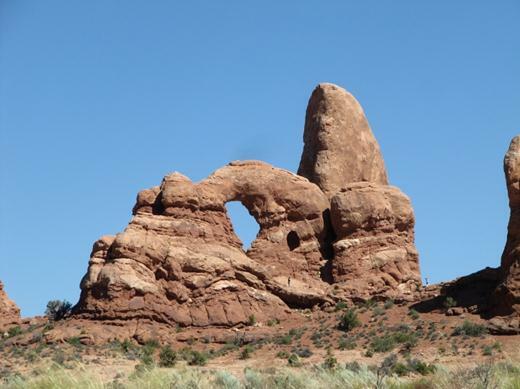 If you can book it in advance there’s a great three hour Ranger led hike through these formations. Apparently the tour is amazing but we couldn’t get on L as you have to book weeks ahead. 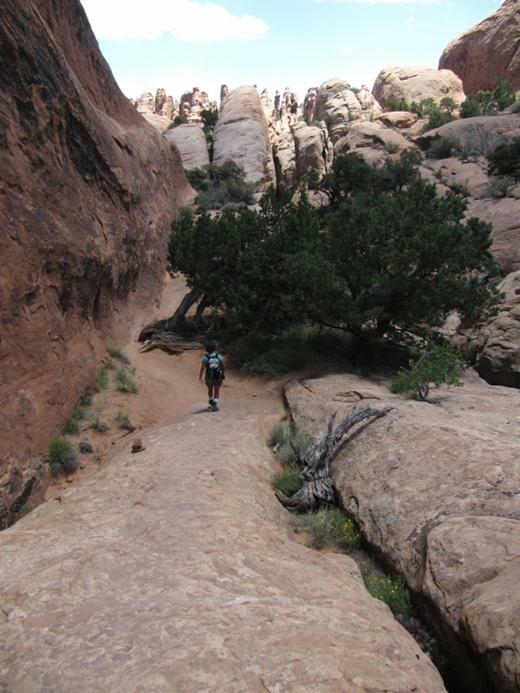 Of all the hikes we did, we really enjoyed the Devil’s Garden – with all the side trails – the best. 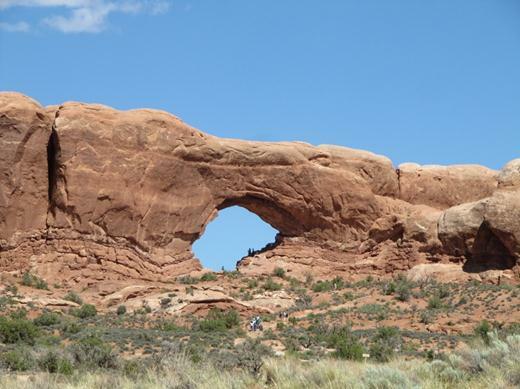 The Double O arch was very cool! Hiking through the fins was also amazing. 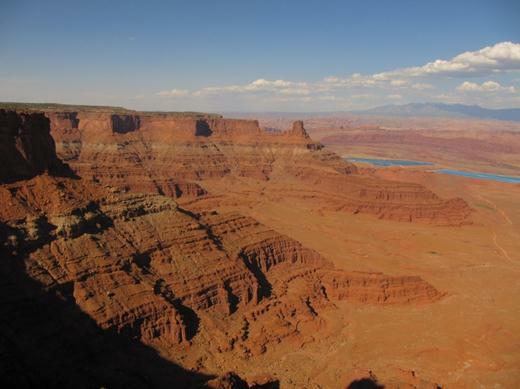 The rock layers in the park sit on a salt bed thousands of feet deep. Salt under pressure is unstable so with time and fault movement domes are formed. 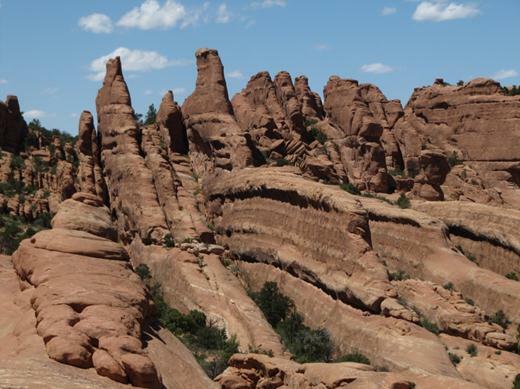 These domes cause cracks in the rock leaving free-standing fins. Erosion worked its magic on the fins and the result is arches, or just plain old conversion to sand. After hiking through the fins for a while they start to look like cruise ships…ah cruise ships. We also really liked this Double Arch. 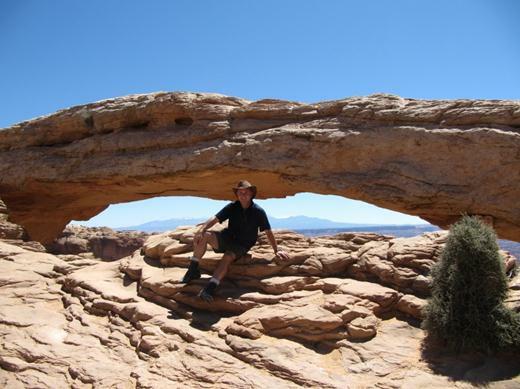 After our 12 km hike through the Devils Garden we decided to hike up to this arch and take a siesta under its shady dome. Ok one more arch…we’ll call this one the ‘A-Ok’ Arch. 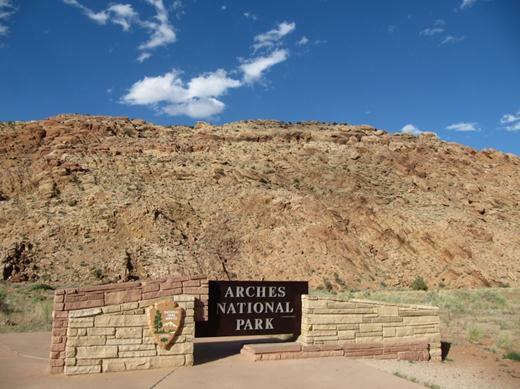 After several days playing in Canyonlands and Arches National Parks, we decided it was time to hit the road. 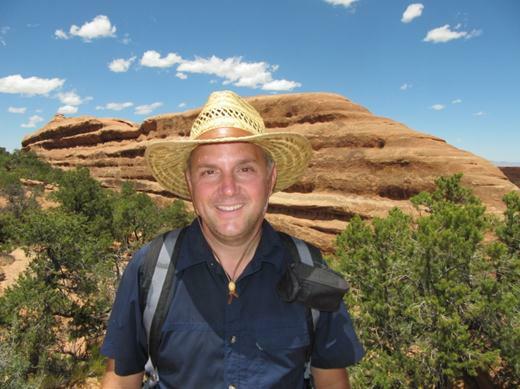 Next up…we are not sure….at this moment we are debating on whether we should travel an extra 1500km to catch southern California (Yosemite, Kings Canyon, LA, San Diego) …OR…do we spend more time in UTAH and COLORADO?? ?…it’s so stressful making these big decisions. Awesome trip. Great pics. How will you ever come back to a desk job……..